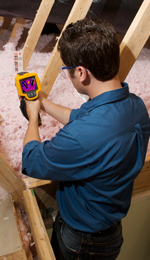 Building Thermal Imaging Surveys to help identify energy loss areas. Building Thermal Imaging Surveys to help identify energy loss areas. Building Thermal Imaging Surveys with Powerpoint Engineering Ltd.
Air Leakage detection by identifying failed weather seal or an air pathway through plumbing or electrical service installations. Moisture ingress and identifying traces of water invisible to the human eye. To learn more about our Buildings Thermal Imaging Surveys, or to arrange a booking please contact us today.